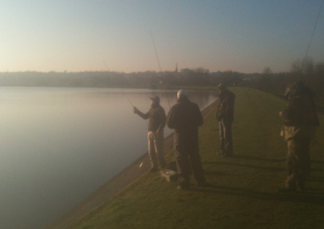 The recent Casting Clinic saw FFF Master and APGAI Associate Mike Heritage take half a dozen of us through the details of good loop formation and the double haul technique, in a rare morning of ideal sunny weather and light winds. In most cases, it only took a few hints to see an immediate improvement, and gave us all something which we can build on over the forthcoming season. The East Warwick looked good as well, with quite a few moving fish, and in fact received a top-up stocking of another 250 rainbows a few weeks later. 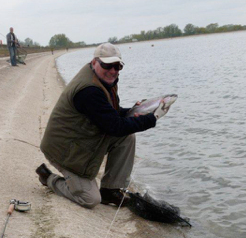 Frank Daley was individual winner of the 2012 Hinckley Shield at Rutland Water in October. His 8 fish saw him take the top spot, ahead of Rob Edmunds with 6 fish, and Chris Evans who also had 6 fish. 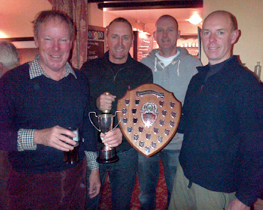 Frank’s performance helped his Rutland Water Fly Fishers ‘Main Basin’ team win the shield, apparently the first time the Rutland club has won this trophy for 11 years. Our annual outing to the River Test at Wherwell saw good weather again. Although it was freezing early morning before breakfast, once the sun got up we enjoyed a beautiful day with light winds and great visibility. Grayling up to 44cms were caught on nymphs and dries, with Vinnie’s mate even managing a couple of rainbows from the lake on buzzers. The recent Fly-tying Evening saw Andrew Green knocking out a succession of Boobies which were promptly snapped up by Sid McKee, who is already using them to good effect on the reservoirs. Coral and Cat’s Whiskers were the favourites. Another coach trip was organised to Farmoor. Even at short notice we still managed a turnout of 20 or so, most of whom concentrated on Farmoor No1. Stronger winds and colder conditions did not put the fish off, and even though it was slow going on nymphs, a succession of good fish were taken on Tadpoles and Minkies on the Intermediate. We are looking to make this a regular event, so check your diary for next year. October’s Start Fly-Fishing had chilly Northerly winds but Liam Costello still managed to take this fin-perfect rainbow trout. Three other fish were lost and several takes missed. 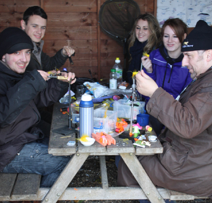 Coaches Andy Hathaway and Matt Holden demonstrated casting while Gary Inwards covered fly-tying in the hut. 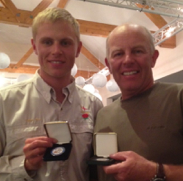 Tony Fox and Harry Fox came 2nd and 3rd in the recent Loch-style National at Bewl Water, qualifying for the England team in the Home Internationals next year. On a day of light winds and overcast conditions that suited their favourite dry fly method they did extremely well to top a high quality field. Congratulations to both!! 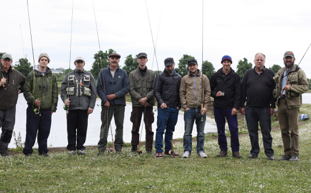 Although the Wateraid Charity match coincided with the hottest day of the year, both the turn-out and the fishing did Walthamstow proud. 37 of us enjoyed surprisingly good fishing, catching 41 between us, with the fish often high in the water, despite the bright conditions. 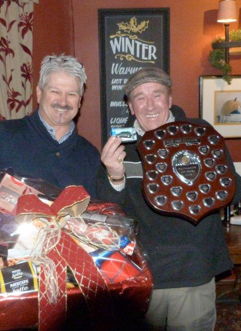 We raised £750 which will be matched by Thames Water, as manager Rupert Newby, who presented the prizes, promised. Top bag, Charlie Abrahams 13-12-8. 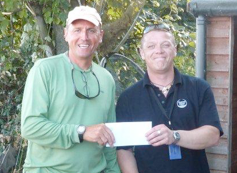 Tony Fox did well to come third in the recent Bewl Floating Line match, winning £350. 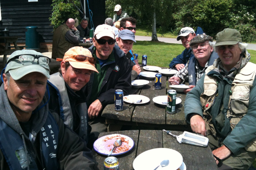 John Ferguson, Kevin Blackwell, Harry Fox and Mike Heritage also fished this event, which enjoyed good fishing, apparently unaffected by the introduction of any-method rules. 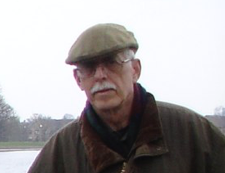 Rex Howes We were sad to hear that long-time member Rex Howes recently passed away in hospital. Rex, a keen member since the late 80’s, was always seen at our AGM/Auctions, and took part in our Benson & Hedges qualifiers, Wednesday Evening series and Fur & Feather matches. 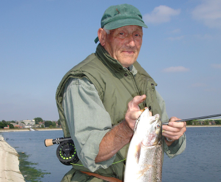 He was a very experienced Walthamstow regular, who helped many younger fly fisherman over the years, and will be much missed. 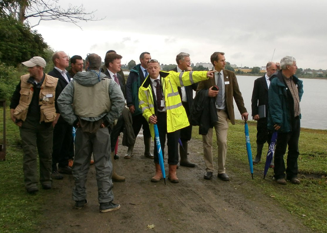 Environment Minster Richard Benyon visited the reservoirs to see for himself the challenges presented by cormorant roosts. 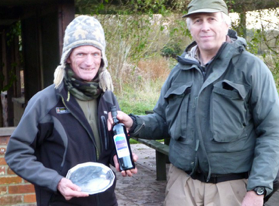 Facilitated by Martin Salter and Mark Lloyd of the Angling Trust, this visit was timed to take place prior to the launch of the Interim Report from the DEFRA Fish Eating Birds Review Group. This documents is intended to investigate issues surrounding fish-eating birds in the UK and their management. See here>> for more information. John Ferguson, Kevin Blackwell and Phil Smithson were on hand to give our side of the argument. A bunch of us fished the Bewl Pro-Am in conditions that would have been ideal had it not been for a strong SW wind. Naturally, the most fish were to be found in the rough stuff by the Dam, but pulling produced good sport, including some of those hard-fighting blues. 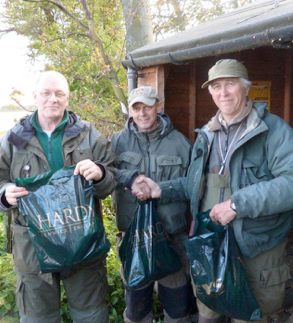 Limit bags to John Ferguson, Mike Heritage and Kevin Blackwell, who got a bottle of whisky for being the Top Amateur. 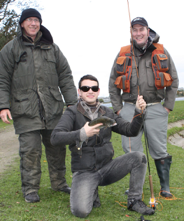 Gary Inwards reports on yet another well attended Start Fly-Fishing He says the group was extremely fortunate with the weather and enjoyed fly-casting tuition from Andy Hathaway and Danny Williams. Fishing took place in the afternoon, but as the fish were not really biting, the students made the most of the knot tying and fly-tying tuition provided by Gary in the hut. Even so, 20 minutes from the end Tony Kelly hooked and landed a fish on an Orange Blob. We recently held a meeting with Manager Rupert Newby to discuss the closing times, Walthamstow Wetlands, a Water Aid charity match at Walthamstow in August, and other matters. We will publish more details of what was discussed, along with the minutes in due course. 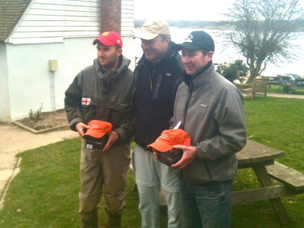 Frank, Kevin, Michael, Harry and Andrew fished the South East FFF Pro-Am Bank at Bewl Water. 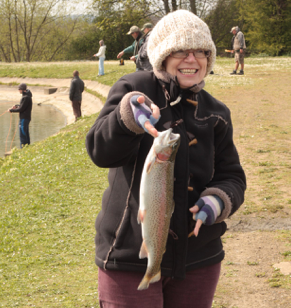 A much colder day than we’d had during the week led some of us to think the fish might be deep. In fact, as one or two of the locals showed us, they were only about two or three feet down. Harry did well, while Frank cottoned on late in the day but still managed a couple on floater and Diawl Bachs, which was about the average bag. 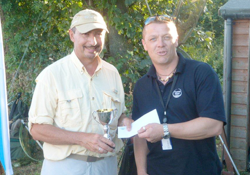 Winning pair was Sean Brooks and Ian Watts, who said he’d try and join us at Walthamstow for the Greys. Harold Almond is the subject of a profile by Peter Lapsley in this month’s Fly Fishing & Fly Tying (April issue). This covers his adventures in Nicaragua, but also has detailed instructions on how to restore and care for silk fly lines, which have seen renewed popularity recently. 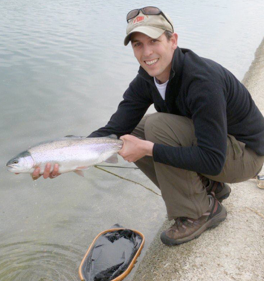 Some top French competition anglers prefer them, especially for river fishing. 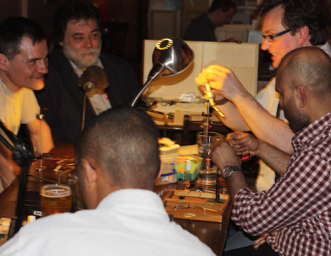 The last Fly-tying Evening saw another good turn-out, maybe encouraged by the recent spring weather, with Gary and Andrew demonstrating how to knock up essential stillwater and river patterns. These included Tadpoles, F Flies, Black Gnats, and Klinkhamers, produced at a frantic pace until Gary pulled the plug on it all and plunged us back into gloom. Another stocking has gone in. Two tanks into Nos 4 & 5 reservoirs, with 300 rainbows into the East Warwick. This is line with what we were told in February, with 1,000 fish going in each month. 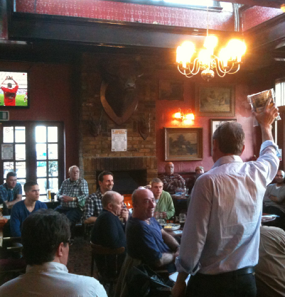 The AGM/Auction saw a reasonable turn-out enjoy the wide choice of East London beers in our new venue, the King William IV, opposite Tesco’s in Leyton. We were able to report on our recent meeting with the rangers (see below) and also hand out entry forms for the Walthamstow heat (Individual & Team) of the Greys Bank Championships (see details>>). Dave Jarvis was elected as our new Chairman, with a vote of appreciation for the work in this role carried out by Gary Inwards, who will be continuing as Newsletter Editor. Our ‘bring & buy’ sale then followed, with some keen bidding over more than 80 lots, including some decent rods, reels, lines and fly collections. A pre-AGM meeting between the committee and rangers Myland & Gregg threw up some positive news. Full details at the AGM but, as you can see from the picture, Thames have already been moving a couple of the platforms from the Railway Bank of No4 to the Causeway, with another to be added alongside. 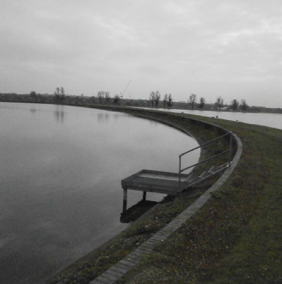 This was raised at our last meeting with Thames, and should help older anglers, in a wider range of wind directions. Myland also confirmed there will be no increase in ticket prices, despite a slight rise in the cost of stockfish. With the removal of the close season on Nos 4 & 5, Thames will be continuing to stock. 1,000 rainbows went in on the 16th February, with another 1,000 planned to be stocked in early March. The Final Fling attracted getting on for 20 members despite chilly conditions persisting for most of the day. 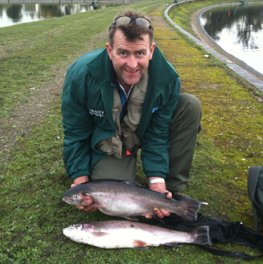 Dave Jarvis got off to a good start with a couple of early fish off the West bank of No.5, adding another later. Joe O’Brien had one on a bloodworm on the floater, while there were others caught on Boobies further along the Causeway. There was brief spell of activity in the SE Bay of No5, and also by the Lifebuoy on the East bank of No4. With half an hour to go Andrew Green moved in next to Vince King, who had just landed one on the Railway Bank. 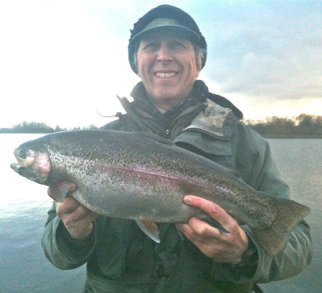 With his last cast Andrew landed a 7-4-8 rainbow on a DI7 and Black & Green Booby to take the sweepstake. Despite the conditions, many of these fish are silvery and feeding hard on bloodworm, caddis and fry, which promises good things for the extended season.